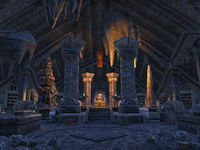 Morkuldin Forge is a crafting station found east of Morkul Stronghold, deep inside Morkul Descent. The marked entrance is initially locked, and can only be unsealed by entering Morkul Descent and completing the quest The Hand of Morkul. Here, you can craft items in the Morkuldin set. The Hand of Morkul: Discover the ancient secrets of Morkul Clan. 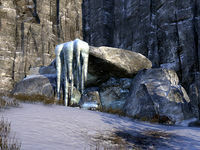 Although the map marker for this location appears to point to the settlement at the top of the cliff, the entrance to Morkuldin Forge is in fact located at the base of the cliff and cannot easily be reached from above. This page was last modified on 22 November 2018, at 20:58.